Wonder if I you can substitute one oil for another in a recipe? Not only can we cook with oils but we can also use them for cosmetic purposes. Find out the number of things you can use oils for and the difference between them all. 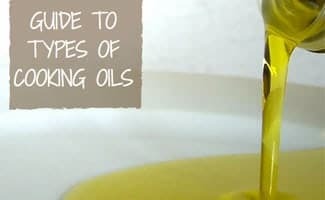 We’ll even get into the nitty-gritty of types of oils in more detail, including our top picks for each as well as some of the basic terminologies. What’s the difference between monounsaturated fat and polyunsaturated fat? Both have distinct health benefits including reducing cholesterol levels which in turn decreases the risk of coronary artery disease and stroke. Monounsaturated fats are also high in Vitamin E. Monounsaturated fats are found in olive, peanut and canola oils as well as avocados, nuts and seeds. Our bodies need Omega-3s and Omega-6s, which are both found in polyunsaturated fatty acids and contribute to brain function. Omega-3 also reduces inflammation and lowers your risk of heart disease. Polyunsaturated fats are found in vegetable oils like safflower, corn, sunflower, soy and cottonseed as well as in nuts and seeds. Monounsaturated fats are typically looked upon as being better for you while polyunsaturated fats are still good for you but you must have the appropriate diet (high in antioxidant nutrients) to reap the benefits. What Does Extra Virgin Mean? You’ll notice that some of these oils, like olive oil and coconut oil, have extra virgin forms. This means that it is a particularly fine grade of oil. So, in the case of olive oil it is made from pressing the olives and containing a maximum of 1% oleic acid. However, it means something different for coconut oil. Virgin or extra virgin coconut oil is made by cold-pressing the coconut’s liquid from the meat and then separating the oil from the milk and water. Whereas typically, coconut oil is made from the coconut copra and chemically treated. Now that you have a better understanding of the types of oils we can dive deeper into the benefits of each. Below you’ll find an explanation of the various types of oils and what they can be used for along with our recommended picks. Read on to learn more or click on the type of oil below to jump to a particular section. Almond oil can improve your skin, hair and health. It’s commonly used on the outside of the body to alter your appearance but is also consumed at times. Many beauty brands incorporate almond oil into their products like Burt’s Bees and Nivea, but nothing is better than mother nature’s pure form. Almond oil is a great source of Omega-3 fatty acids and has high potassium content and low sodium content. It is low in saturated fats and rich in monounsaturated fats. Almond oil is often added to salads, dips and glasses of milk for consumption. So not only can it help the appearance of your body but also the inside of your body. Many believe that canola oil is a healthier cooking oil while others think it’s a no-no in the kitchen. We’ll give you the facts and you can decide if it’s for you or not. Canola stands for Canadian Oil and has the lowest saturated fat level of any cooking oil at 7%. It is high in unsaturated fats including Omega-3 fatty acids. How is it made? Canola oil is obtained from rapeseeds that have been bred to include fewer negative substances. Unfortunately, the majority of the world’s canola crop is genetically modified. Some believe that canola oil has high levels of erucic acid, which is a material that can be poisonous to humans. Erucic acid can also lead to respiratory distress or even blindness. Because of canola oil’s high smoke point, light flavor and smooth texture, it is very versatile in the kitchen. It can be used for the following. Canola oil is a type of vegetable oil which is the worst oil to use in the kitchen. Many consider canola oil to be a healthier alternative to vegetable. What do you think? Coconut oil is made up of lauric acid, capric acid and caprylic acid. Its personal properties are antimicrobial, antioxidant, anti-fungal, antibacterial and soothing qualities. It has a higher melting point than other oils so it is often in a solid form instead of liquid form. Coconut oil helps with tons of stuff similar to almond oil. Coconut oil can be used to replace butter or vegetable oils in your recipes. This oil is also very versatile when it comes to cosmetic uses. Flaxseed oil (also known as linseed oil) is used for many things. The seed comes from the plant Linum usitatissimum, which is used to make medicine. It is commonly used in manufacturing as a waterproofing agent in soap, linoleum and paints. Because flaxseed oil is high in Omega-3s there is a pill form that many use as a supplement to aid in health and beauty. It is also used as a cooking oil and in margarine. Seems like flaxseed oil can do it all! Grapeseed oil is light in color and flavor and has a hint of nuttiness to it. It is a polyunsaturated oil and contains linoleic acid. It is often used for cosmetic purposes as well as in the kitchen. It has a high smoking point so it is often used to fry foods but you can also use it in dressings and sauces. Combining it with other oils makes for a great massage oil since it glides on the skin well and helps moisturize your skin. Olive oil is the king of oils. It is a monounsaturated fat and is considered to be the healthiest option in the kitchen. Any time you reach for the butter or another type of oil you should replace it with olive oil. The ratio for changing any other oil to olive oil is the same and for replacing butter it is 3/4 tablespoon of olive oil to each whole tablespoon of butter. One thing you’ll want to know is that if you plan on heating your olive oil for frying or something else you will lose all the flavor. So you may want to choose a lower grade to cook with (that’s what the pros do). Check out this minute and a half video from Chef George Mateljan of why you should not cook with extra virgin olive oil. Vegetable oils are simply bad. They’re bad for you and they’re bad for our planet. They have been extracted in unnatural ways and contain very high levels of polyunsaturated fats. Unfortunately, many of the sweets we bake include vegetable oil as an ingredient. However, we’ve got a substitution for you! Replace vegetable oil with apple sauce in your brownies, cakes, muffins, etc. It’s a healthier substitute and can be replaced with equal ratios. If you need oil to fry something use one of the other oils above. The table below shows what oils can help with certain cosmetic things. Can Oils Improve Your Overall Health? Some oils can help prevent illnesses or even help you bounce back from others. When you purchase your oils make sure you buy the appropriate one for cosmetic or culinary purposes. There are different grades of oils and not all forms of the oils are the same so be sure to check the label to know what it’s meant to be used for. The cosmetic oils may include ingredients that should not be ingested. What do you use your oils for? Misquitos are the worst, and they all LOVE me for some reason. I can’t check the mail without getting bit. Seriously! Bee’s stuff looks good so am gonna order some and use it every day!